Cupcake stands and cupcake trees can be costly, but before you spend a fortune, check out this DIY cupcake stand you can make on the cheap! 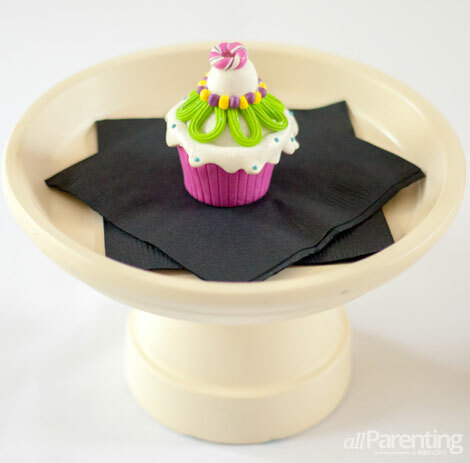 Using inexpensive clay planting containers and saucers, learn how to craft up an adorable terra cotta pot cupcake stand and wow your guests at your next party. 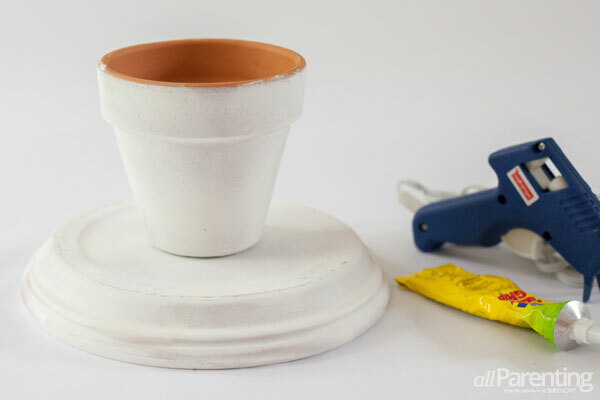 Spray your terra cotta pot and saucer with primer to help the top color stick well to your DIY cupcake stand. Keep in mind that the inside of your pot will not show, so you won't need to waste time priming the inside surface. Allow to dry for one hour. Next, turn your saucer face down and set your pot right side up in the center of your saucer. Use a pencil to trace the bottom of your pot to ensure it's centered when you glue it down. 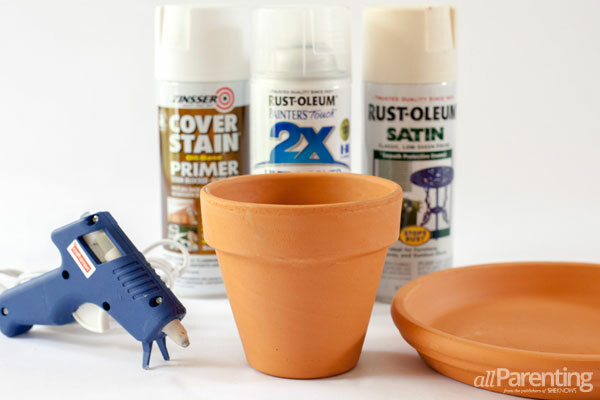 Then, apply hot glue or any type of strong-grip glue to the bottom of your terra cotta pot, being mindful to keep the glue from showing by applying it just inside the outline of the pot's bottom. 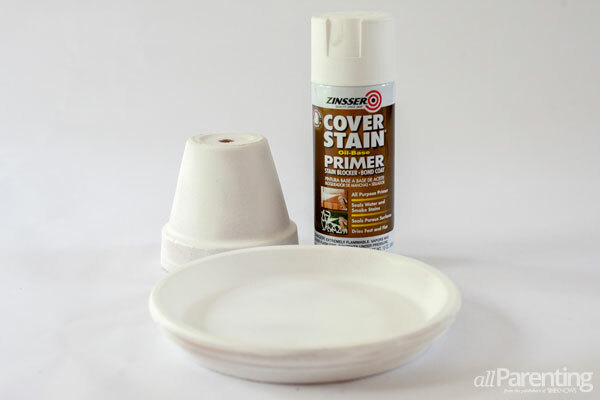 Adhere the bottom of your gluey pot to the back center of your terra cotta pot saucer. Allow to cure according to the glue's directions if using something other than hot glue. 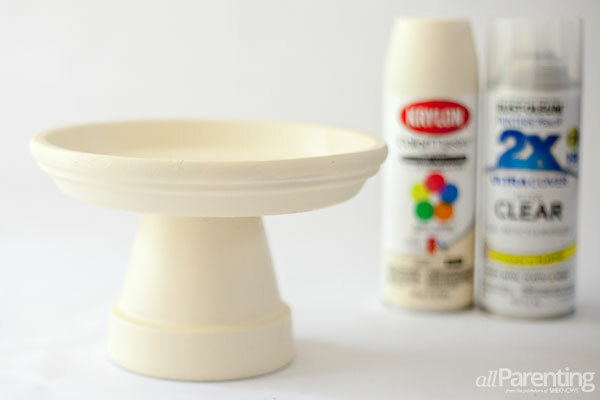 Now, give your DIY cupcake stand two coats of ivory spray paint — or any color you choose — allowing to dry between coats. Follow with a coat of clear gloss spray to seal in the cuteness and dry according to directions on the can. But, before you display your yummy cupcakes, be sure to use a piece of food-safe parchment paper or scrap book paper to keep the food from touching the painted surface! Note^ You can also add more tiers to your DIY cupcake stand by simply adding smaller terra cotta pots and saucers to the top of your craft. Just be sure that the diameter of your pots can support the size and weight of your saucers.